The next day I got up early and went down to the dealer's room to see if I could help out with the prep for the afternoon. This still remains one of the highlights for me, because it was tremendous fun preparing, chatting with committee members, ripping open boxes to see what goodies the publishing houses had sent for the gift bags and in particular really getting to know everyone better. In the afternoon we packed the bags and at this point I knew that we were nearly done. So I soon rushed upstairs to get ready for the evening. Once dressed we loitered in the bar and waited for the arrival of Terry and Liz Martin from The House of Murky Depths, publishers of Killing Kiss. More socialising ensued. And very soon the bar became packed with conventioneers. Appearing as always - the inscrutable Stephen Jones and his lovely lady Mandy, swiftly followed by charming editor Jo Fletcher (Gollancz). Amongst other interesting bodies were, David J Howe (Telos Publishing), Adam Nevill (Virgin Books), Ian Whates (Newcon Press), Peter Crowther (PS Publishing), Lee Thompson, Guy Adams & Trudi Topham (Humdrumming), Darren Turpin (Orbit), Lee Harris (Prism) and many, many more people, all set for a weekend of furious drinking and socialising. We ate an early dinner and then attended the Quiz which was hosted superbly by David J Howe, whose pirate speaking (well, it was International Talk Like A Pirate Day) had everyone in stitches - I don't even think our table was that bothered about winning (which is just as well because we lost) - we were just enjoying the laughs and atmosphere, which was brilliant. The word of the evening - 'Arrrrrr' Afterwards, a return to the bar and more mingling. Among the surprises was a film crew from an internet channel called Lurid TV. They came up and asked if they could film my launch the following morning, and interview me. Of course I said yes! I spotted Conrad Williams who asked if I would attend his reading that evening - I think he was worried that no-one might turn up! But the room was packed to hear a segment from a new novel which was really inspiring and entertaining. I went to bed soon after because unfortunately I needed to have an early night - Telos and Murky Depths were hosting a joint launch in the morning and I had to be fresh. Killing Kiss was launched at 9.30 am in the Dealer's Room Bar along with the superb non-fiction of Telos Publishing: books on Torchwood, Till Death Us Do Part and Taboo Breakers (Films). The launch was very well attended and great fun. (We treated everyone there to tea/coffee and chocolate biscuits!). The film crew from Lurid TV turned up as promised and filmed the whole event, and interviewed me afterwards. I hope I gave them what they wanted. While I was doing that, Murky Depths and Telos were selling books like hotcakes. Some lovely and revered people attended. I chatted to fellow vampire writer Raven Dane, and the charming Doctor Who and fiction writer Rob Shearman. Among the others I spotted in the whirl were Paul Finch, Chaz Brenchley, Peter Mark May (Demon) and Alison Kershaw (Didikai Witch) as well as publisher Tony Lee. (Conrad Williams didn't show, despite his promise - but he's forgiven because he actually had a very late night for the sake of the convention the previous night!) Also among the guests were Tim Lebbon, Guy Adams, Simon Clark and many, many more. I've never been photographed so much in my life. Following the launch I went upstairs to the tenth floor and delivered a reading from Killing Kiss which seemed extremely well attended. Lurid TV also came and recorded it all - so I'm sure it will turn up online at some point. I was so delighted that several attendees bought the book afterwards and I was told by one very nice fellow writer that the reading had 'wetted' his appetite and he really wanted to read the book now. (I felt very not worthy and thrilled all at the same time). It was over! I could relax, and naturally more socialising ensued - and some alcohol - which I was very much in need of by then. That afternoon I attended a super panel discussing how different publishers manage the editing and publication processes with Jo Fletcher (Gollancz), Adam Nevill (Virgin), Peter Crowther (PS) and Jonathan Oliver (Abaddon) which was extremely well attended and very informative as usual. And a brilliant panel on Writing for Doctor Who - the guests being Rob Shearman, David J Howe, Mark Morris, Simon Guerrier and Simon Clark. What a line up!!! This panel finished way too quickly, one hour definitely wasn't enough as all the speakers had years of experience as writers between them and clearly the large audience wanted to ask more questions. In the evening we attended the banquet - food was good I thought - the wine wasn't bad either and the company of friends was excellent. On our table, David and Rosemary Howe, Sharna Connor (my sister), Brendan Vaughan, Simon R Green, Roy Gray from Interzone, Simon Morden and more people I didn't know (sorry!). But we all had a fab time anyway! The BFS Awards were announced after the banquet. I won't list them in full here but there were some nice surprises. See the BFS website for details http://www.britishfantasysociety.org/news/?p=361. There followed the Raffle - carried out with a great deal of fun and frolic by Guy Adams and Sarah Pinborough. These things can be a bit dull - but this year wasn't at all. I won a James Barclay book with one of my friend's tickets - unfortunately I'm too honest and I am going to have to give it to him! James kindly signed it as well. Maybe I should remind my friend that it's my birthday next month ...? Finally we all retired to the bar, where I crashed onto a sofa with my sister Sharna and was rapidly joined by Raven Dane, Rob Shearman, Simon Guerrier, Adam Nevill, Brendan Vaughan and Paul Campbell. There followed some intellectual discussions on Doctor Who with Rob and Simon, which as a fan, was absolutely brilliant. I eventually went to bed at 3.30am (haven't done that since I was 20 - some 70 odd years ago) but was so excited that I didn't get to sleep till around 5am. Despite the late night (early morning), I had to make sure I was up and at them bright and early - Sharna wanted to kill me by this stage (we haven't slept in the same room since we were kids and she thinks I'm way too perky in the morning). An eventful last day was planned - FantasyCon was far from over. So my first port of call - I wanted to hear my lovely new friend Rob Shearman read from his short story collection and it was definitely a reading to remember. Fantastically presented and a brilliantly moving story, all delivered with a dose of really dry humour. Following Rob in the reading room was Raven Dane who presented extracts from all three of her books (Series Legacy of the Dark Kind) - including the current one which is as yet not released. Raven said later that she hadn't read live before and yet she was so calm and professional I'd never have guessed, and the reading, like Rob's, was inspiring. Then in the afternoon I was on a panel called 'How to Promote yourself' with Darren Turpin and Lee Harris moderated by Allen Ashley - I learnt such a lot from Darren and Lee's comments about promoting effectively. And was modestly able to put my penny's worth in about my usage of social networking sites. The convention concluded with a massive small press book launch in the main bar - which was Terry's final chance to sell copies of the book, and attendee's final chance to buy. After that, we crashed in the bar with friends relaxing. Saying sad farewells to friends old and new as they left. Luckily some other folk were also staying until Monday and so we had people to chat with into the evening. With FantasyCon officially over for another year, I say: well done team! You excelled yourselves. Just a little note to say, I'll be reading an extract of Killing Kiss at FantasyCon at 11am on Saturday 20th September 2008. This takes place on the 10th floor, so I'm told. If you are attending, please come along and give me some support. If I'm good then clap, if I'm not then bring your own tomatoes. I've just had word from my publishers that Killing Kiss will be launched in 2 weeks at FantasyCon. The launch will be a joint with Telos Publishing and will take place in the DEALERS ROOM BAR on Saturday 20th September at 9.30-10.30am, with free coffee/tea/biscuits with every purchase. This will be a great opportunity to meet up with me and if you buy the book as well, I will happily sign it for you. There is however, one drawback, the event is only available to Convention attendees - but you can still sign up and attend on the day. 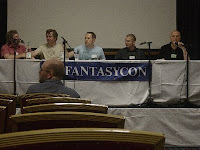 Go to www.fantasycon.org.uk for further information. Over the summer I've been recording a CD called Demon Lover & Other Eroticisms . This was done with a friend, Singer/Songwriter/Composer Penny Nicholls, whose musical talent helped to create what we think might be a new genre. Penny Nicholls and I breaking down one of the poems, exploring the meaning, tone and mood prior to the creation of the music. We call them Mohemes. A Moheme is a poem that is, not just set to music, but is reformed to work with the music. It was a very collaborative and creative process. Yes, the poem came first. Yes the poem can stand alone on the page or be read as it is, but, when we added the music in this unique way - and I don't mean just for ambience, it was CRAFTED to suit the words and the mood - then something very unique happened. The emotion, the tone, the mood and the words all became enhanced. This was the birth of the Moheme. One problem I came across, however, is that some of my poems are written in a male voice. So I asked my friend David J Howe to record a couple of these for me. So we had a great deal of fun on that day! Lol! Here's David recording the CD title poem Demon Lover. You can hear some of these on my Myspace page (see links on the right). So listen and enjoy. But remember, if you are attending FantasyCon, you'll get a free copy in your membership goodie bag.